Have you faced a situation in which you’re offered a once-in-a-lifetime opportunity? What would you do? What’s goes through your mind? What’s your decision-making process? As I reflect on this, I’m often reminded of the decision that I made to accept an offer to work in Singapore back in 1992. Back then, I was really happy with my job as team leader managing 6 developers and going to my dream university pursuing my MBA. I was contented and satisfied with my progress of my career and looked forward to finishing graduate school. I was not ready for change, but the factors that helped me decide to pursue the opportunity were my desire to gain international exposure. I made the decision and moved forward and never looked back, I felt blessed that I was offered that opportunity that forever changed my life.When I started my career in Information Technology, I was amazed by the intelligence level of the people that I worked with. They were fast learners and I felt that I was falling behind. I decided that if I would like to keep pace with everyone, I must do something different than what I’d been doing in the past. In this case, I decided to invest more time in learning. That would mean staying late and working nights and weekends. But over a course of 1 ½ years, I noticed that I was keeping pace and making good progress. I realized that to differentiate yourself, you have to do something different than everyone else. In my case, that was time investment and upfront sacrifices like not hanging out with friends and being proactive by volunteering to do extra projects. While on recent trip to Cebu, Philippines attending a family reunion and celebrating my father-in-law’s 88th birthday—God Bless the man, he is still sharp and active—we took a side trip to a place called Oslob. 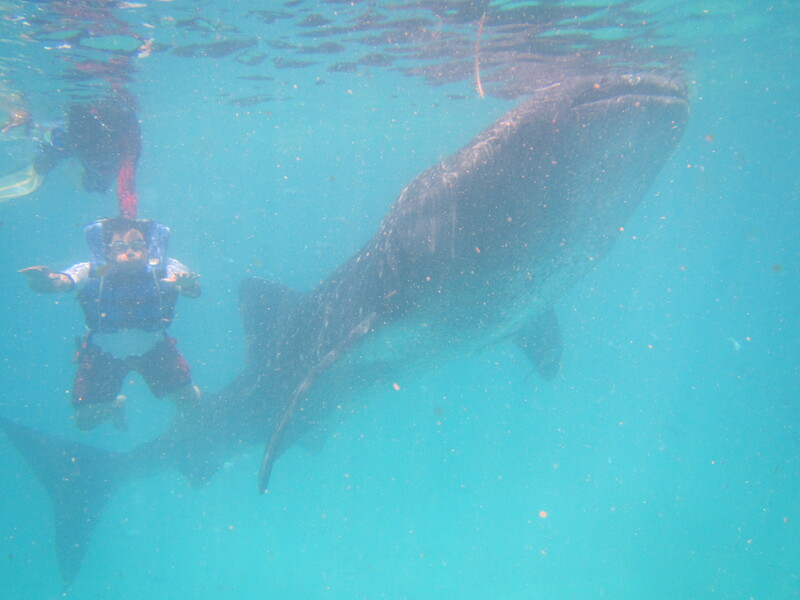 The place is known for its whale shark. I was particularly nervous because I never associate the word shark with anything good. Growing up I had nightmares after watching Jaws for many months. We arrived at the place. We the attended the briefing then the tour guide provided us with our life vests. I was on the boat and as it went farther out to sea I was getting nervous. My wife (Jane) and two daughters as well as my wife’s nephew and cousin were with us on the boat. A few minutes into the boat ride, I started seeing the whale sharks in the blue water. Jane’s nephew and cousin jumped in the water. My daughters declared that they wanted to join them. Off they went. Then there was me, sitting and staring at Jane. She asked me, “Are you going in?” My answer was, “I’m not sure I want to.” She said, “You’re here already, why not give it a try? I thought about it for about a minute and thought this could be the only time we do this, so I proceed to get in the water. I knew this was one of those once-in-a-lifetime opportunities. How many people can say that they swam with the whale shark? Not that many, so I thought that I should seize the moment and just enjoy the moment. Seeing the faces of my two girls and the joy that the experience gave them is priceless. In life, sometimes we are faced with these once-in-a-lifetime opportunities in which we need to make a decisive or quick decision that can alter the rest of our life. It is important to note that we need to step back and assess the situation accordingly. The key is not to dismiss the opportunity outright because we are afraid of change, because you might never have that opportunity again. In your career, it is best to seek growth opportunity by learning something new. By doing so, you will be well equipped and prepared when the opportunity presents itself. It is better to be prepared and miss out on an opportunity because you were not selected than to miss an opportunity because you did not have the requisite skills. My once-in-a-lifetime opportunity opened new doors for me and I could never image what life would be if I did not take the first step and take a calculated risk. I suggest that you be ready for whatever comes your way and seize the moment by making it happen.